The group performs new music, builds many of its own instruments, and breaks down the boundaries of the traditional concert program. 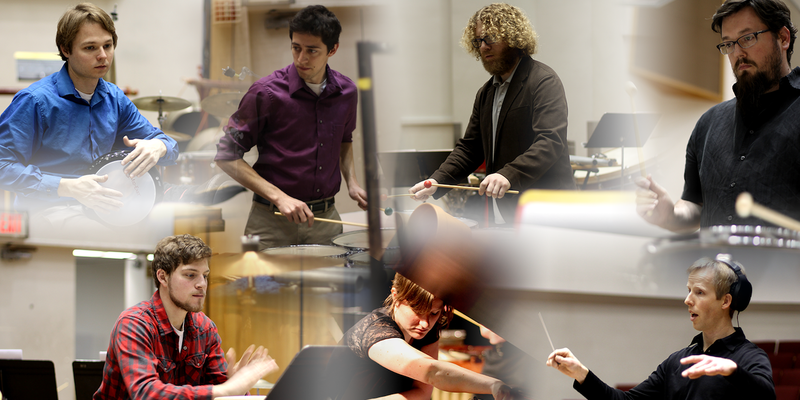 Formed in 2011, Clocks in Motion began as an extension of the University of Wisconsin-Madison’s Graduate Percussion Group, and now serves as the ensemble in residence with the UW-Madison percussion studio. Among its many recent engagements, the group served as resident performers and educators at the Interlochen Arts Academy, Rhapsody Arts Center, University of Michigan, Baldwin-Wallace University, and the Madison Museum of Contemporary Art. Learn more about Clocks in Motion (and check out their recently-released CD) at their website.